I suspect that there's a bit of New York City here. And I think that Mr. Trump tends to use this pattern when he enumerates problems or promises that he thinks ought to be obvious or at least already known. 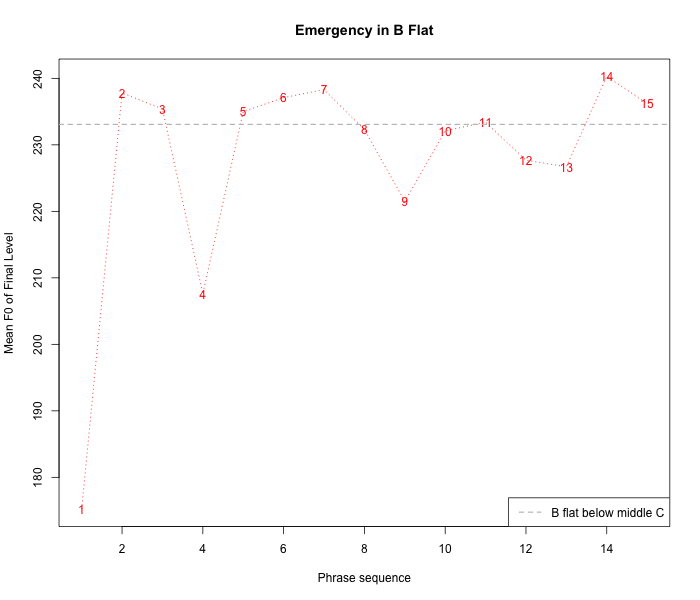 We did a couple of perceptual experiments, which found first, in a forced choice task, subjects reliably hear these rises-to-plateaus as signaling that speaker thinks the listeners already knows the items in the list, and second, subjects hear the plateaus as making the speaker sound condescending. As for the potential New York connection–I looked into Jewish English intonation for my dissertation […], and found some evidence for increased use of these types of contours by older Jews in listing environments. 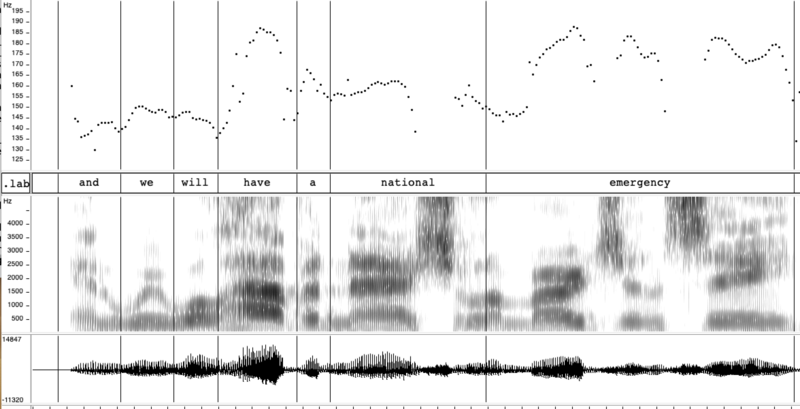 So, I'd say it's definitely likely, at least to the extent that we want to connect Jewish English intonation to New York City intonation. Alec Baldwin's SNL version is here — and again here. For more on quasi-chanted passages in Trump's rhetoric, see "Trumpchant in B flat", 10/2/2016; "Blues in Moore flat", 12/15/2017. And here it is accessible from outside the US, which SNL generally isn't. As soon as I heard that strange sing-song, I knew it would be appearing here. Thank you Mark. Another explanation for the weird prosody: Trump is rehearsing all this procedural stuff because he's going to be using it to justify to his base why the Emergency Order will be overturned in the courts. So this is some sort of magical incantation. The prosody sounds to me a lot like Jeanine Pirro of Fox News and of New York (and formerly a DA and judge, so presumably she knows the procedurals well; gawdelpusall that somebody so unhinged should ever have had any legal authority). To me, this sounds like it signals two things — first, that the speaker is presenting the list as objectionably long; and second, that the speaker is presenting the list items as being unimportant. The vibe is "I have to say these things; hold on and I'll eventually get through them… all…". Imagine rolling your eyes ostentatiously every couple of items. That impression isn't really compatible with the fact that Trump uses the same intonation on the final element, "and we won", which terminates the list (so indicating that the list just keeps going and going is weird) and is a victory for him (so trivializing it is weird). But it's very compatible with the report that people think this makes the speaker sound condescending. I didn't find the prosody to be strange — it felt natural to me, except for its use on "and we won". But given that I was surprised there, it seems possible that this same prosodic feature is used with different meanings by different speech communities. largely i agree with Michael Watts. i'm a little surprised that you say you didn't find it strange though. the speech style and it's communicative purpose are totally banal in many circumstances, but is it not somewhat strange to hear it spoken on such an exalted stage? It is (in my view) overtly disrespectful, but I'm pretty sure that that doesn't conflict with Trump's views on the subject. I'm also pretty sure that being overtly disrespectful is normal at all social levels. I wouldn't say that the speech's venue conflicts with the style or the communicative purpose; the major conflict I see between the delivery of this message and the "exalted stage" is that this message strongly implies (as I read it) that you shouldn't take the things it refers to seriously, and speech from an exalted stage generally tries to convey the impression that whatever it's talking about is a serious matter. It conveys that his opposition is a joke, which is secondary to the real message, which is I am powerful. More likely, the winning is presented as so predictable it won't be exciting. @Michael W This looked to me like AntC didn't believe the prosody was normal for English. I didn't and I don't, after reading the comments. It's extremely/unusually marked prosody in any context, let alone from somebody who's supposed to be carrying the gravitas of office. It sounds mocking, insulting and disrespectful (of whoever is its target — the legal system in this case). I agree with @Trogluddite (me ears are also British, mostly): it's the tone of a parent scolding. A bad parent: a parent who is not fit for the responsibility of bringing up children; a parent who is unaware that parenting entails not behaving like a petulant child yourself; a parent who does not understand that mocking and patronising is something children do in the playground (and it's not appropriate there). being overtly disrespectful is normal at all social levels. There are appropriate ways to express disrespect of authority figures/institutions that are overbearing or over-reaching (irony, satire, appeal to logic, appeal to decency, to natural justice). But that level of petulance amongst adults? I think not. Maybe privately with your significant other after a particularly frustrating day at work: let off steam at a boss whose only 'management technique' is to mock and belittle staff. That prosody is not "contextually appropriate" in any public place. BTW the office of POTUS itself used to represent a figure of authority up to a couple of years ago — especially from the previous 8 years of hard work to regain respect after the prior holder. How on earth can the most powerful single individual of the world's only superpower play the victim game? AntC, I agree with you on this. To my ears it was completely inappropriate, and completely consistent with what we have come to expect. This view is actually incompatible with the view that there's something strange about the prosody itself. If Donald Trump were to use intonation that conflicted with normal English usage, it wouldn't sound insulting. It would sound foreign. As to the "parent scolding" interpretation, I'm guessing that's a difference between American and British English. I cannot visualize a parent expressing their anger by emphasizing how boring the litany of the child's misdeeds is. I'm also going to have to disagree that "mocking" is an inappropriate way to express disrespect while "satire" isn't. Satire is a type of mockery. Some other evidence that the President was in a New York state of mind: his reference to the "appellate division," which is the NY-specific term for the state appellate court (although here he clearly meant the federal court). @Justin Long: I'm guessing that Trump has a long history of being sued in New York state courts (e.g., by stiffed creditors), whereas his experience with being dragged through the federal courts only started in earnest after he became president. To me, the whole sing-song recital spoke of his contempt for legal process, or any process — as if to say, in the voice of a petulant three-year-old, Can't we just get to the part where I win? When he started in with that, I halfway expected him to say "neener-neener" at the end. a) I take it "neener-neener" is British for nyah-nyah. b) Fowler, in The King's Englsih, notes that meter in one's prose is "a sure sign that the fit is on him." In the Trump-person's case, singsong counts as meter. Satire is a type of mockery. I think that might be exposing a difference in meaning of 'satire' in AmE vs the E of the cricket-playing nations. Let me wade into a cultural minefield. It's noticeable how many US late night shows have imported hosts from the cricket-playing nations. But the best satirist currently is Stephen Colbert. He very seldom resorts to mockery; his humour is witty and satirical precisely because he respects the institutions of the US (particularly the office of President); and because he can draw a contrast between the respect he would like to show vs the ridicule which the current holder attracts. One other accomplished US satirist I would credit: Barack Obama. His speeches at the White House Correspondents' dinners are masterful not only for their wit but also because they enhance the prestige of the office: as much self-deprecatory is 'digs' at other personages. Possibly Seth Meyers and Stephen Colbert have been reading this thread; or possibly the observations are blimmin' obvious. Both said 'sing-song'. Meyers said 'ramblings', '5-year old'. Colbert said 'reciting his torah'. Both noted this is for consumption by his base, not the country as a whole. (Trump specifically mentioned Sean Hannity and Rush Limbaugh.) Neither thought this was acceptable behaviour for a President announcing a National Emergency. Also in another part of the speech, I'm sure I heard Trump say 'Nobel Peace Price'. @Anthony: “neener” has been in use in at least some parts of the US since at least the mid-1980s. We used it in south western rural Ohio (Warren County, bear Cincinnati). @Michael Watts — Call it mockery or satire; by any name it's punching down. When speaking to and about citizens of his own country, if the president of the United States punches, it can only be down, and I don't think that's acceptable behavior. To me, the entire POTUS litany represents a parenthetical or footnote to the body of the speech. It delineates something that does not need to be said because most listeners already know it (that his opponents will challenge his actions in the biased Ninth Circuit court where they will predictably will, but will then loose when the case gets to the US Supreme Court.) This is why the tone is monotonous and does not rise at the end. POTUS says it to demonstrate that he is all too aware of what will transpire and that, in the end, it will have no effect. For the British readers, I would compare the effect to POTUS saying to his opponents, "Go ahead. Do your worst. I'll win anyway." No rising tone here. ^ A work of genius.